Yvonne Carmichael is fifty-something, happily married and a well respected scientist. When she meets “X” she does something totally out of character and begins an affair, one that has terrible consequences and ends with her and her lover in court and facing prison. Apple Tree Yard opens with the court case and then takes us back to the start of the affair. It isn’t explained why the two are on trial but given they are at the Old Bailey, you know it can’t be good. You assume it’s murder but you can’t be sure. 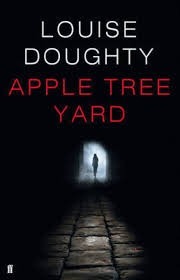 I had been looking forward to reading Apple Tree Yard for a while and it was a book I couldn’t put down when I started reading because I wanted to know what happened. Or, at least, I wanted to know why Yvonne and “X” were on trial. Whether they were guilty or not didn’t interest me so much because I didn’t care about them. As the narrator, I found Yvonne unsympathetic. I could understand that she was bored and lonely but I thought her actions were selfish and a little naive. She seemed oblivious to harm she might be causing. For a while, I did feel sorry for her but then she tells the truth and any sympathy went. In the end, I just felt she should have made different choices. I suppose part of the point of the book is that sometimes we don’t do the right or best thing and once things spiral out of control, it’s hard to get them back on track. “X” we only know about through Yvonne so, probably not surprisingly, he isn’t fully formed and changes as Yvonne’s attitude towards him changes. The novel does throw up interesting questions about how women are meant to behave; how they are judged differently from men; and how they are treated by the legal system. It also made me think about truth. The court case shows how truth is manipulated by Barristers to get the verdict they want. Yvonne’s narration shows how people tell their version of the truth. Sometimes this is so they don’t hurt others. Sometimes it because the truth will not show them in the best light. Despite the fact that the book made me think about these things, and that it was “unputdownable”, I can’t say I enjoyed it. This was disappointing as I had expected to – I’d read some great reviews (although maybe that was the problem, I expected too much). I think it was my dislike of Yvonne. In the end, I couldn’t get past it. One of those books I think. Have to say most of my book club loved it. It’s always a surprise when you read a book that just doesn’t hit right.